Kids and adults who play Minecraft might also enjoy crafts and hobbies with a Minecraft theme outside of the game. From props to help you play Minecraft in "real life" to themed greeting cards, these projects over something for crafters of all ages. 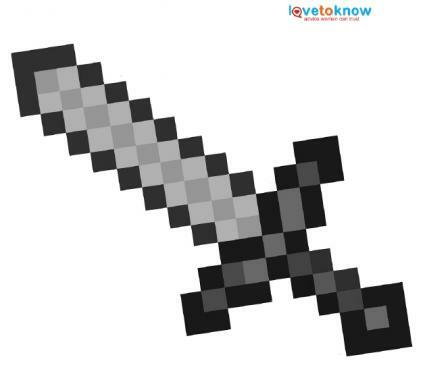 Create this life-size replica of the Minecraft iron sword to hang on your wall, or use it as a prop for a costume party. 1. Download the template below by clicking on the image to open the .pdf file, then print it out. Click "Fit to Screen" on your printer options to ensure it prints to the correct size. If you need help downloaind any of the printables, check out these helpful tips. 2. Cut out the template and place it on top of a sheet of cardboard. 3. Glue the template to the cardboard and cut the cardboard around it to get a stiff sword. 4. 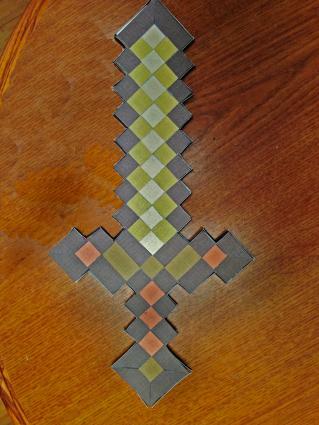 Select four colors from the cardstock and cut them to cover the squares on the sword. 5. Cut the darkest, outside color of cardstock into thin strips and adhere them to the edges of the cardboard sword to give it a 3D appearance. 6. If desired, repeat with more cardstock on the back side of the sword for a prop. Use basic quilling techniques to create this Creeper head. Adhere the image to a scrapbook page, greeting card or anywhere you desire. 1. Separate out the light, medium, and dark strands from the quilling paper pack. 2. Divide the strands in half lengthwise so they are half the length they were when packaged. 3. Grasp the end of a dark green strip in the ends of the tweezers and wind the paper tightly around the tweezer tip until you reach the end of the strand. 4. Glue the free end to the rest of the curled paper and pull it off the tweezers. 5. Glue the tightly curled paper to the cardstock. Repeat with the other shades of green to form the image of the Creeper head. 6. Let the glue dry completely. Make this fun pop-up Creeper card as a birthday card or for any occasion. Just adjust the text on the exterior of the card to suit your purposes. 1. Download the Creeper template below by clicking on the image to open the file, and print it out onto a sheet of light green, textured cardstock. 2. Cut along the black lines in the template, leaving the rest of the image attached to the paper. 3. Gently push the Creeper from behind to free the center of the image from the rest of the cardstock. 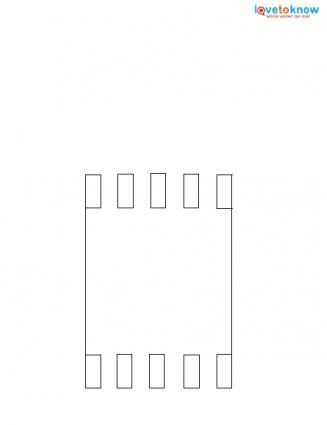 Fold the tabs at the top and bottom of the image to get it to stand up right. 4. Fold the card in half, pushing the Creeper down flat so it remains hidden when the card is closed. 5. Glue the darker green cardstock to the back of the light green card to hide the cut marks in the cardstock. 6. Open up the card and lay it out flat so the Creeper faces up but sits flat. 7. Draw a grid on the surface of the Creeper using the tabs as a guideline for how wide the squares should be. 8. Fill in the squares with paint pens to resemble the image of the Creeper. 9. Paint, stamp, or stencil your text onto the card's exterior. If desired, change the colors of the cardstock and the colors used inside the pop-up to create Steve, bricks, or any other Minecraft-themed character or item. Whether it's you who's the Minecraft enthusiast or it's someone in your life, you'll find these crafts a great way to bring the game to life. Make one or all of these paper crafts to capture the Minecraft spirit.